As we have briefly discussed in the previous two posts on rooftop solar and micro wind turbines, one of the major obstacles faced by these technologies is their intermittency – the fact that they only generate power when the wind is blowing and the sun is shining. For interested readers, this and other challenges are discussed in much more detail in other pages. The most convenient tool through which the intermittency can be addressed is energy storage. And the storage technology attracting the most attention is battery storage. It certainly is true that cheap battery storage can help a lot with integrating intermittent renewables into modern electricity grids. If much of the large solar output around mid-day could be stored for consumption in the evening when demand usually peaks, solar power would be of much greater value to society. Actually, if energy storage technology was cost-effective, it would be great for our electricity systems regardless of intermittent renewables. We generally use significantly less electricity at night than during the day and peak-demand often lasts for only an hour or two. This variable load causes an inefficient use of power infrastructure. 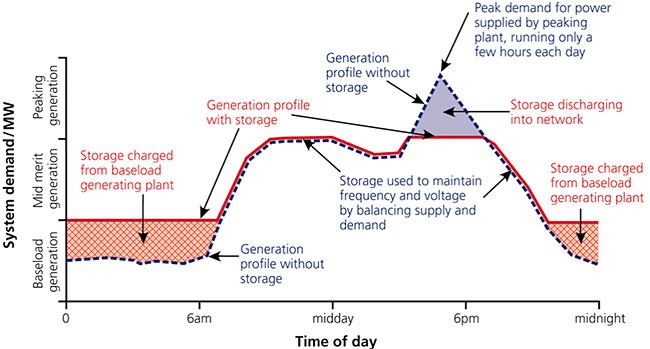 If cost-effective storage could shift some electricity generation from the night to the peak periods, we would need fewer power plants and would be able to operate these plants at a greater efficiency (shown below). Unfortunately, however, battery storage is still far from being cost-effective. Yes, like most clean energy technologies, battery costs have been declining significantly in recent years, but we will require much greater declines before it can be economically deployed. For example, I recently had an online discussion with a staunch solar advocate (and installer) who quoted me a solar power system with battery backup which can generate electricity at about $0.90/kWh – about five times the standard retail electricity rate. From a more fundamental perspective, the problem with battery storage is that it consumes a large amount of energy in the manufacturing process. The vast majority of this energy will inevitably come from fossil fuels, implying that a solar power system with battery backup or actually have a rather large carbon footprint. As an example, a recent paper examining the potential of rooftop solar in Australia (one of the best places for solar deployment on Earth) found that such a system would only generate two times the amount of energy that was used in the manufacturing process over its entire lifetime – an Energy Return on Investment (EROI) of 2:1. This is a sizeable problem not only because of the large carbon footprint implied, but primarily because it is impossible to run a complex civilization like ours on such a low quality energy source. 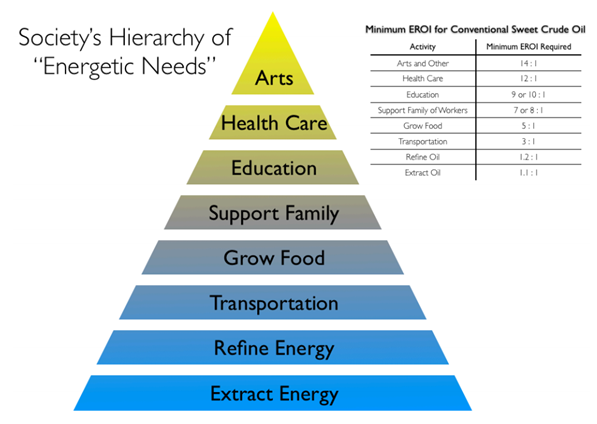 The chart below illustrates this by showing the energy return on investment required by several different levels of societal complexity. One battery-oriented idea which deserves mentioning is the use of battery capacity in electric vehicles as a grid storage mechanism – so-called vehicle-to-grid (V2G) storage. This approach needs a massive fleet of electric vehicles, requires a similarly massive network of smart-chargers which can withdraw/store electricity in this massive fleet of electric vehicles, and also proposes the use of EV batteries (which are designed primarily for a a high power-density) for grid electricity storage (which requires a design specifically aimed at low costs and long lifetimes). For these reasons, this approach will also not be viable for many decades. Despite these challenges, however, it is possible that battery storage can play a non-negligible role over coming decades as prices further decline. Cost-effective energy storage will open up a wide range of opportunities that have never been available to grid operators before. Until such a time, however, battery storage is not recommended as an option to reduce your personal carbon footprint. The batteries themselves still have a very large carbon footprint and currently available battery backup systems are inherently unable to support our civilization. There are many other much simpler and more efficient mechanisms for cutting your footprint.